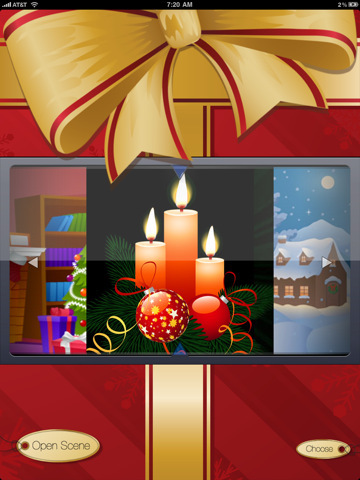 Pictured, from left: Candle scene; scene chooser (iPad); fireplace scene. NEW YORK, New York - December 2, 2010 - Award-winning Windows Mobile software house Conduits Technologies, Inc., announced today the release of iCelebrate ~ Christmas 2.0, an application for the holiday season that pairs vibrant, animating yuletide scenery and the very best of streaming Internet holiday radio stations for iPad, iPhone (retina display optimized) and iPod Touch. 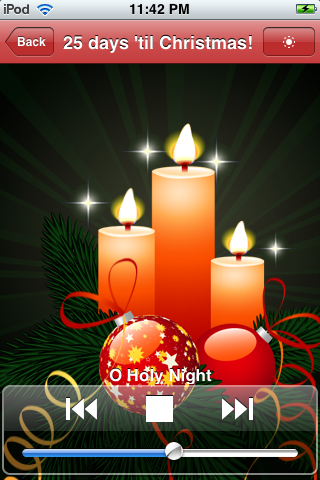 iCelebrate ~ Christmas provides you with five gorgeous, animating holiday scenes, access to beloved modern, traditional, country, smooth jazz and spiritual Christmas music from top holiday Internet radio stations, and Twitter integration to let friends and family know that you are listening to holiday favorites. It truly is the most wonderful time of the year! iCelebrate is a universal app that runs on all devices running iOS 3.1 or higher. It features HD graphics when running on iPhone 4 and iPad, is multitasking aware (to stream songs in the background on iOS 4.2), and is AirPlay enabled for Christmas music playback on Apple TV. The set-up of iCelebrate ~ Christmas is simple: choose a holiday music genre (modern, traditional, religious, smooth jazz or country), choose a holiday scene to pair with the music (a luminescent Yule log; lovely candles and ornaments; a story-book white Christmas; a stunning trio of twinkling Christmas trees; and at last, a snow globe with a friendly snowman), and then press play! 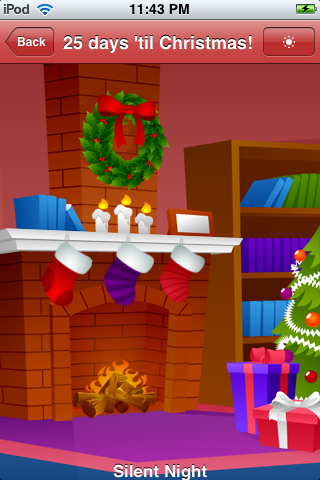 Candles will flicker, stars will shimmer, lights will twinkle, and stockings will sway over a brilliant fireplace - all to the beat of the music! Sugar plums, candy canes and gingerbread houses sold separately! If you associate iCelebrate ~ Christmas with your Twitter account, embedded song titles will be tweeted to your Twitter stream. iCelebrate ~ Christmas is now available for $0.99 at the iTunes App Store where you can locate it under the 'iCelebrate' or 'iCelebrate Christmas' search terms. For more information, including screenshots and Internet radio station information, visit the Conduits website at http://www.conduits.com. Conduits develops commercial applications for Windows Mobile and iPhone, including the award-winning Pocket Player (an alternative media player), Pocket Slides (a fully-featured presentation solution), Pocket Artist (a drawing and image manipulation program), and seven other Windows Mobile products. iScratch Myself (a humorous picture and target-based game) for iPhone and iPod Touch was just released in November 2009.
iCelebrate ~ Christmas is a trademark of Conduits Technologies, Inc.. Microsoft, Windows and/or Windows Mobile are trademarks or registered trademarks of Microsoft Corporation in the United States and/or other countries. Apple, iPhone, iPod, iTunes, and/or Apple iTunes are trademarks or registered trademarks of Apple, Inc.. Other product or service names mentioned herein are the trademarks of their respective owners.